Our first home-cooked meal. Tortellini and red sauce from our "pantry" in the sunroom. Stove worked. Sink worked. Forks worked. Life is good. Saturday and Sunday Norm would be at the Boston Sailing Center, operating S/V Melissa as part of their Open House weekend. Free sailboat rides in Boston Harbor! My plan for Saturday was to touch up some of the wall paint in the teeny spots, with an artist's brush. Second task was to sand and stain all the woodwork. We've been using Olympic Red Oak interior stain, a can of which was left behind by the former owner. We've used it in the living room, when Norman stripped and refinished all the woodwork there. It's down to the bottom of the can now, so I headed out to try to find a replacement. Olympic Interior Stain is impossible to find apparently. The only hardware store that was listed on the Olympic website as carrying interior stain, didn't have it when I drove over there. They said they only carry exterior, and haven't had any interior for years. And that was the only place within 30 miles I guess. So I bought Minwax Red Oak stain, and prepared to punt. First I pre-treated the wood with Minwax Pre-Condition. This soaks into soft wood and helps it absorb the stain more evenly. Since there are various woods in the new trim, this step made sense. Then I mixed the remnants of the Olympic Red Oak with about 1/3 of the can of Minwax Red Oak. I applied the stain with a foam brush. It seemed to thirstily absorb the stain, and not much wiped off, as I brushed and wiped. I think it came out a little darker than I had wanted. Maybe I should have been more generous with the Pre-Conditioner. 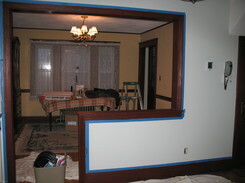 The baseboard and chair rail are the original color of the woodwork. The trim around the opening and the pass-through (or reveal as Willie calls it) are all new trim. The new stain is close. Sunday's tasks include putting the first coat of varnish on the woodwork. We put the first coat of varnish on the thresholds Saturday evening. Second coat went on today. They are nice pieces of oak and match the rest of the home's hardwood flooring. Then I have all the second and third coats of cabinet paint to apply. This goes on the window over the sink, the toe-kick under all the cabinets, the crown moldings, and minor touch-ups. We're coming down the home stretch now. The garage has a car in it again, instead of tools and materials. 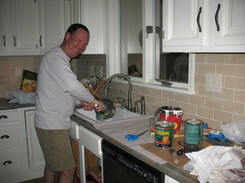 We picked up the wall paint on Thursday, and Friday morning Norm put the first and second coat on. 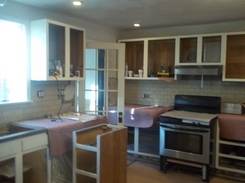 There really isn't a lot of wall in the kitchen that needs painting, so that went pretty quickly. We had some interruptions Friday afternoon, but when we got back home, we took up the luan and admired the cork floor. That was probably a bit premature, since we still have some second and third coats of the cabinet paint to do, chiefly on the toe-kick and the crown molding. And the casement window. And all the finishing of the woodwork. But I'll be careful.We really wanted to see the floor. We're waiting for the rest of the hinges to arrive, before we can hang the final eleven lower cabinet doors. 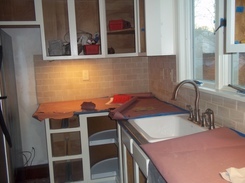 We took up all the rosin paper on the countertops too, so we could get the whole effect of the new wall paint and the color of the countertops. 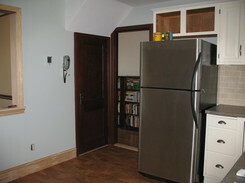 Benjamin Moore paint again, in a color called Gray Cashmere. It's really in the green family, a creamy green, that immediately looked blue when we painted it on. In different lights it looks bluer or greener. It works with the countertop color either way, thank goodness. So that was Friday evening's fun. Finally the kitchen is looking like a kitchen. We spent this last week glued to the television. We don't actually watch television much, but the events surrounding the Boston Marathon Bombing impacted us more than peripherally, since we live so close to the city. Work from home was mandated for Tuesday for me, while Emerson College was closed and all classes were cancelled (for Norman). He had come down with a nasty cold over the weekend, so spent most of this week expectorating and draining, most unpleasantly. I had to try to concentrate on work, while listening to the non-stop news broadcasts from the living room downstairs. 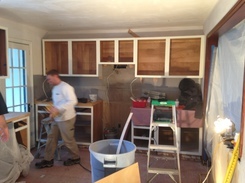 The kitchen seemed to go slowly this week, although in retrospect, today, we can log a lot of progress. During the CYC Skipper's meeting Tuesday, I chatted with Willie about the order of operations. The luan floor couldn't come up until the ceiling had been painted. What did he think about a 40% water emulsion for a first coat? Hmm, never heard of such a thing. Why not prime and then paint? What, right over skim-coat plaster? Well, yeah. How about I do that for you? Really? Would you? And there you see the ceiling with a primer coat of paint. And the light fixture that will be over the kitchen table when we can move it back in. Thanks Willie! Still life with faucet and neighbor's garage. A creative moment for Norman. 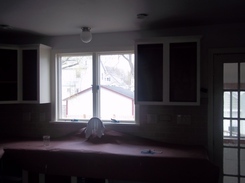 Friday was a lost day for kitchen progress, due to the complete Boston lockdown and shutdown, while waiting for the resolution of the apprehension of the Marathon Bomber suspect #2. I had wakened up early Friday, due to the lack of no train sounds. Usually trains begin their ride to the northern terminus somewhere around 5am, to begin the daily commutes into the city from Lowell. I had no idea that the absence of the regular train sounds would arouse me from sleep. While wondering what was different, I heard the 5 o'clock news report on the radio, which was my first indication of the drama that was unfolding in Watertown, just a couple of miles from our house. 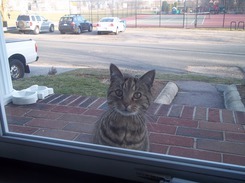 Since Willie was also in a lockdown community, he was unable to make it to the job site. No one could move about, so we spent the day working from home and watching the news and the drama of the day unfold. This weekend is a release weekend for me, but between tasks, I am trying to do some work in the kitchen. Willie stopped by this morning to give the ceiling a coat of paint. I spent snippets of time in the basement, alternating between loads of laundry and making the marks for the pilot holes for the hinges on the doors. Norman, still coughing, went down for a much needed nap. I got all the doors marked and was working on drilling, when Norman came down and joined me. He is much better at the big electric drill. My little hand drill had given up after less than an hour. We got all the hinges applied to the doors, and went upstairs to see how we could make fitting them a repeatable process. Together we worked out a pilot hole template for the upper cabinets. We marked a piece of scrap wood that fit inside the opening, with pre-drilled holes that lined up with the position of the hinges on the door. In addition to our home-made jig, we used a T-square, a level, multiple screwdrivers, several bits and a pretty neat right-angle contraption that made it easy to drill in small spaces, like in the narrower cabinets. It was easy for Norman, not for me. By the time I had the spatial relations worked out, my arm was aching from holding the weight of the combined parts. 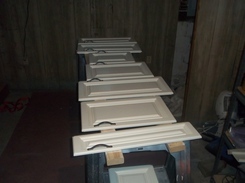 The experimental first pair of doors. Not too shabby! The third set of doors. We were on a roll now! Order another set of 11 pairs of hinges. I think I ordered these around the time of the February release. Note to self: Don't make purchases based on mental arithmetic during a release. Not enough brain cells to go around. Scroll back up and take a look at the French door, the 15-light door, that is our back door entry from the garage, backyard and driveway. It's behind Norman in the picture of the first pair of doors. This door used to be the light of our life. When we moved in to this house, there was no door at all, where this door now is. The opening to the back door just opened into the unheated shed area, which made the kitchen unbelievably cold and drafty for 3 seasons a year. Our first home improvement project that we did together, was to drive to Maine to some salvage yards, measurements in hand, to find a door that would fit our opening. We found this door, with its crackled finish and hazy panes, and thought we had died and gone to heaven. This ancient door was the best-looking feature of our old kitchen. Now it really looks shabby and worn. Which means the rest of the kitchen looks pretty darn good! Lots of small things start to come together at the end of the project. God bless Willie. He keeps us on track and moves things along at a quick enough pace that we don't descend into the depths of despair. We're programmed to expect magic though, with the HGTV promise of a weekend reno, or a week overhaul, with TV dash and flair. Not so in the real world. If you've been following along, you would know that we rethought the dove gray grout color for the backsplash, because the gray mastic provided too much of a contrast. We were relieved to see that the lighter color we purchased (left) blended in with the travertine. 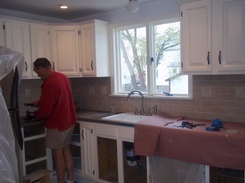 On the right is a piece of backsplash still to be grouted. Good decision. So what were the next big things to happen this week? The undercounter lights were installed. We bought these from Environmental Lights, and the advantage is they are self-driven, thin, and they're dimmable. Tom the electrician came over on Sunday to install these. We had neglected to order the outlet boxes and connectors, and so he couldn't finish them until the parts arrived. Thanks Tom! Don't the new lights look nice? The dimmable feature makes it possible to use them as nightlights in the evening. Doesn't the grout look nice? What! You can't see the grout? Good, because that was the point. The countertops are not red. 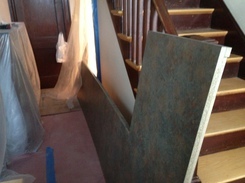 That is rosin paper, protecting the countertops from paint accidents, and tool dropping accidents, and sanding dust and grit, and grout haze, and everything else that could damage them during this phase. This particular weekend, Norman was in Rhode Island, assisting with an Instructor Qualifying Clinic for American Sailing Assoc. candidates. So I was home alone with professionals. While Tom was working on the under-cabinet lighting, I descended into the basement where the 22 doors and 13 drawers were waiting for their 5th coat of paint. I had gotten into a nice rhythm with the painting, roller in one hand and brush in the other, and got the backs done on Friday night, the fronts done on Saturday, and on Sunday, was ready to add the hardware. I had to go into work on Monday, so the project went on hold again. Monday April 15th everywhere else is Tax Day. In Boston, it is Patriot's Day and the traditional day for the Boston Marathon. Not much traffic going into the city, since most Massachusetts folks had the day off. In the afternoon we heard about the explosion and the event and what unfolded next became the story for the next week. Norman came home on Monday evening and I was so grateful to have him home to share the events of the next week. Another week has passed, and as we get closer to completion, it seems harder to measure progress. The changes are not so dramatic at this point, and the unfinished nature of everything tends to impair my ability to foresee how it will look. The floor was the big drama of this past week. One of the biggest benefits of this kitchen redo was to be the addition of heating, with a radiant heat floor mat designed to be used under engineered floating floors, by Thermosoft. 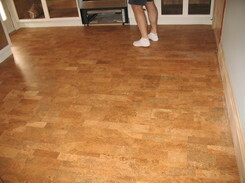 We had purchased Cork Locking Flooring by US Floors from Lowe's. The two of these should have combined to make an easy floor installation and give us the missing heat source. 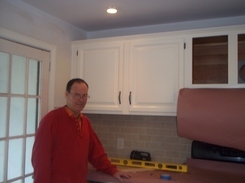 Well, Willie spent most of the day Saturday trying to install the flooring, with varying degrees of success, and plaintive text messages to us while we were on the Cape. Sunday night when we arrived home, we took a look at the first three courses, and saw that the click/lock feature was not clicking or locking. And there were spaces between the courses. We took out some more floor panels and tried joining them ourselves, with varying amounts of success. Small pieces settled together very nicely. Bigger runs would start out alright, but then open up as you added more panels. I looked at youtube videos to see if were missing something. Is there a trick? After seven videos, it seemed there were no tricks. It didn't matter if you started with the tongue, or the groove, or you assembled each course side to side and then across, or added the panels one at a time. Hmmm. 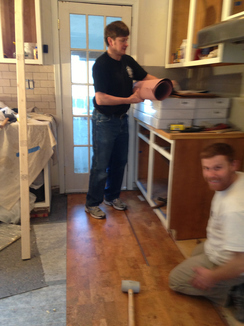 After much more fussing with these Monday and having no success, we figured the flooring must be defective. They had to be ordered through Lowe's and the flooring needed to go down now, so off we went to Lumber Liquidators in Woburn, to see if their flooring clicked and locked. In the showroom, the panels did. And these were the big panels, not small samples. Of course they felt heavier, and we knew they were just better engineered. Right? So, we bought another whole 160 sq feet of cork flooring, even though it wasn't quite the same pattern as the one we had gotten from Lowe's. They did have 20,000 sq feet of stock in Braintree, and we could pick it up today! Yay! On our way out to get some supper, we took the Lowe's flooring back to Lowe's. We brought in a box and asked the Service Manager if he could show us how this was supposed to work. He had never installed this product before, but he was willing to give it a try. Of course, the box we brought in had all the cut pieces, so there weren't too many large pieces, but Mark was able to assemble 3 runs of several pieces, and the first course did stay together. We were dumbfounded. Maybe we needed that special tapping block? 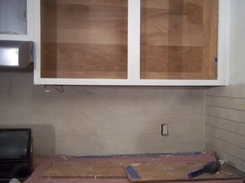 Maybe it was the fact that our first course at home required shims, since the wall under the cabinets wasn't straight? Maybe it was the felt mat underneath for the radiant heat flooring? We went back home and tried assembling the floor on the dining room oak floor, which didn't have any felt. Still not much luck, although it went together more easily on the flat slippery surface. We tried some of each kind, the US Floors from Lowe's and the Lisbon cork from Lumber Liquidators. No difference in results. Norman gave up and went to bed. I took a new box into the kitchen and decided to start along a wall that was straight (relatively). The wall between the dining room and kitchen. I was able to set up 3 courses, using the tapping block to set each piece. And voila, the floor stayed together. Pretty well. Still wound up with a few wider spaces in the first course, by the time I got to the third. But I think we at least had worked out the method, and the problem(s) to solve. Start with a really straight edge, use the tapping block to set the pieces, and adjust the technique to accommodate the friction from the floor mat. Tuesday, Willie and helper Rob, gave the installation another try. 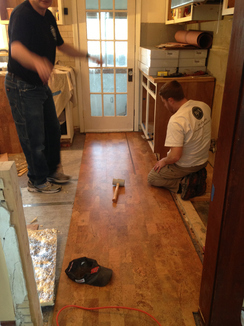 With a little more innovation (some nails may have been involved), the floor began to go down, with the results we expected. Norm sent me these images while I was at work. Yay! We rushed home after work, finally to have a look at our cork floor. But no.... Willie had carefully covered up the floor with rosin paper and luan to protect it. So no joy for me. I'll just have to wait for the refrig to get rolled back in, and the stove to be installed before I can get the full effect of the floor. 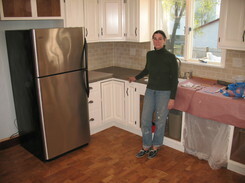 A start was made on the tile backsplash on Tuesday as well as you can see here. I don't know what I expected from the 3x6 travertine, but the dark mastic behind the tiles, made me rethink the grout we had chosen. Dove gray seemed a little too dark. I wanted the tiles to sort of be neutral, but they really do have a color impact, even though they are basically beige. So Norman went back to Tony's and got a grout that is a closer match. 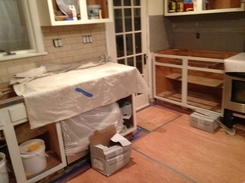 Grout won't go up until this next week, so we are imagining that the dark gray lines are not there. We ran into another problem on the wall behind where the sink goes, under the window. Apparently there is another large cast-iron waste stack that runs horizontally along the wall from the left, to the middle of the window, where these is a joint for the elbow to turn 90 degrees, and then go straight down into the mystery of the basement. 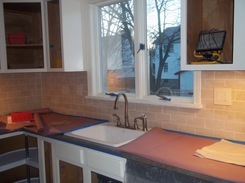 The elbow, of course, sticks out beyond the backsplash surface by some fraction of an inch. Which is making it difficult to lay the tiles under the window and have them flat. The previous backsplash was one might piece of formica surrounded in stainless trim, so the fraction of an inch that it bowed in the middle was not noticeable. If we had known about this additional waste pipe when the plumbing work was going on, we might have been able to correct it. Willie is confident that he will be able to get the tile to lay flat. I am thinking that we probably could have gone with a smaller tile if we had known, which would have made the irregularity disappear in the multitude of grout lines. Perhaps. Maybe that would have made it worse. We're not changing out the tile to see at this point. Oh the joys of older homes. 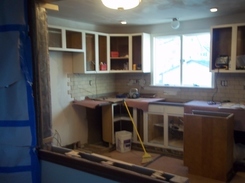 Here's what the kitchen looks like as of Saturday afternoon. Most of the tiles are up. The uppers are back in after coming out and going back in again. All the cabinets actually came out again, to accommodate the floor assembly. 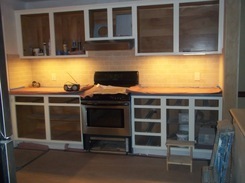 The countertops on either side of the stove are installed. The exhaust fan over the stove is installed and the external vent situation is appraised, although not yet rectified. (of course there was an external vent situation..) The floor heat is installed, and hooked up the thermostat and that works, the floor is installed although invisible, the lamps over the sink and dining area are installed. There is one base cabinet there in the middle of the floor. This is the result of a nailing accident, that pierced one of the supply lines going up the wall behind the refrig. Well actually two supply lines. The plumber found the second one while repairing the first, which had started dripping into the basement where Norman found the leak. Thank goodness he and I were down there trying to remove the pervasive concrete dust. 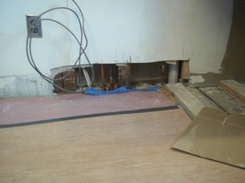 The supply line on the right, just to the left of the waste pipe, was punctured by a nail used to attach the baseboard. Yes, we're up to finish trim! This caused the shower that Norman discovered in the basement bathroom. When the plumber came, he discovered that the supply line further left, was also punctured. So we have two collars now where the holes used to be. It is always amazing how you can inadvertently damage something you can't see, yet if you were trying to hit those exact spots, you couldn't do it in a million tries. So that adventure yesterday set the progress back a bit. This angle from the dining room, shows the former "island" ready for a nice surface and the frame around the opening (reveal I think is the term Willie uses) is all ready for the trim from Anderson and McQuaid. Willie and I have been poring over their catalog, to find just the right match for the original moldings and casings, for the dining room side of the "reveal". 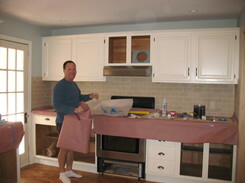 The kitchen side of the reveal, we are going to stick with the colonial stock trim. 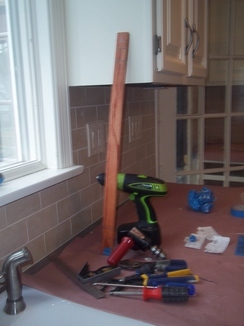 The 1925 trim is too wide to really be effective within the limitations of the spaces around the cabinets for the window trim, the backdoor, and the door to the hall and basement. 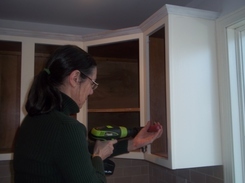 We also selected the crown molding for the cabinet tops, to help them look more like cabinetry and less like boxes. 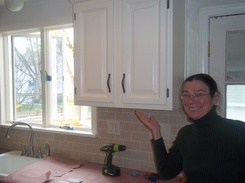 Lots of small things to complete in this final stage, like the trim, the grout, the final painting of the cabinets, painting the doors again, adding the handles and hinges (and getting them uniform! 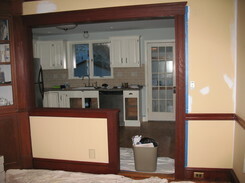 ), painting the ceiling, the walls, and staining and painting the various trims. Will we ever get finished? Beatrice, who has been skittish with folks coming and going, and plastic sheets hanging everywhere, has declined to come in for the last 6 weeks. Her forlorn look in through the front door reflects our current mood. 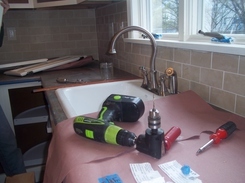 Last weekend was pretty busy, what with Easter and visiting Cape Cod Grandma, so I neglected to log the progress on the kitchen. I spent 3 days of the previous week in Delaware, doing work stuff, so missed much of the kitchen fun. So where were we at? Let's review. 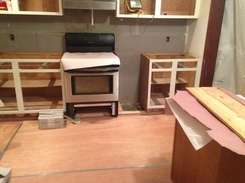 Base cabinets were back in and subfloor had been put down, after the removal of the rest of the concrete. Third bagster of demo debris had been picked up. 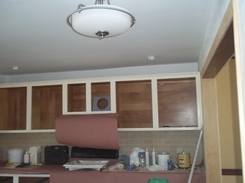 Electrical had been roughed in for under-cabinet lights and fixtures, recessed lights were in. The big countertop arrived. The two smaller pieces apparently got split up in shipment and would be delayed until the following week. Other things arrived by USPS, UPS, and Fedex. 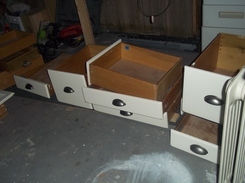 The hinges and handles are all here. The light fixtures showed up at Wolfers and were picked up. Another gallon of paint for the cabinets was ordered from Lamson and Davis. 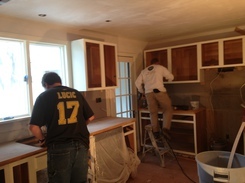 Willie and helper Rob got to work on readying the cabinets for the countertop. 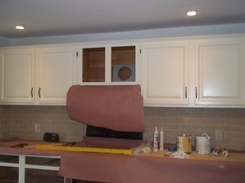 And they re-installed the upper cabinets, all nice and level. 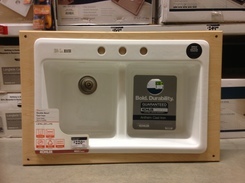 We also looked at new sinks, because we are now so caught up in the spending spree, we figured why not? Shopping at Home Depot though after work, on an empty stomach, does not lead to good decisions however, and in the end, we decided to re-use our old stainless sink. We can always swap it out for new model later. ?? - Any non-white color cost way more than the model on the floor. I thought we really don't need to spend another half a grand or more, on impulse. On Friday, we drove down to the Cape and had a nice poached salmon, with mashed yams and salad, with Grandma. So nice to be able to cook a meal!! And share our stories. Saturday, we visited with Z&T, who gave us the tour of their old/new house. They closed on Feb 28th, and have moved in, and started numerous projects within. So we compared war stories. Their swirl ceilings look so much better painted in flat paint, rather than the glossy paint by the previous owners. Some doorways are gone, and other wall spaces are opened up. They seem pretty pleased. A nice lunch at the Brewster Chowder House introduced us to a new dining spot nearby. They've explored the bit of 6A that is proximate to their new dwelling, which means we'll have another set of establishments to try out over the next few months. Tab had mentioned that the winter storms,Nemo, Ukko and the unnamed blizzards, had really delivered a destructive punch to the Atlantic Coast. I had seen the video of the 2/10 breach in Truro, where the ocean water flushed through the Pamet River and up into the freshwater kettle ponds. Here is a beautiful photo of the Truro breach with the new cut. There was another breach on 3/7, and again on 3/9, seen in this video. 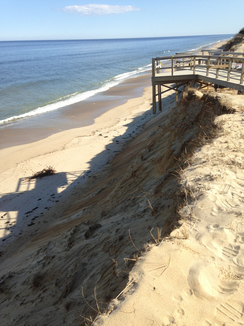 We drove up to Marconi Beach in Wellfleet and found the access to the beach completely swept away. I believe the estimates are about 25 feet of the coastal dunes have been destroyed. Saturday evening was taken up with Cape Cod Grandma and the Easter Vigil at Holy Redeemer. A late dinner was had at home, with Norman and myself relishing the pleasures of running water and hot surfaces on which to cook. Sunday, we took Grandma out to Easter Brunch at Brax Landing. They presented a wonderful buffet,with just about everything that could be construed as brunch, from eggs benedict to roast beef. The sun was shining, the wind was blowing, and it looked like a good day to do our birding route. So with Grandma in tow, we drove to all our favorite haunts. Chatham Light, Morris Island, Stage Harbor, Pleasant Bay, Hardings Beach, Oyster Pond. We saw the new breach in the Chatham outside beach off the National Wildlife Refuge on Morris Island. Since it was pretty low tide, we could see the locals had already maximized their personal utility with this new shoreline, out and about in small boats with clamming gear. Sunday afternoon, we took the leisurely route back along 6A, and were back in our kitchen re-do project in time for a supper from Whole Foods. Thank you for your hot food bar!